LAM Enterprises was formed in 1993 by Lloyd Serfass, along with his wife Angie, and daughter Melanie. 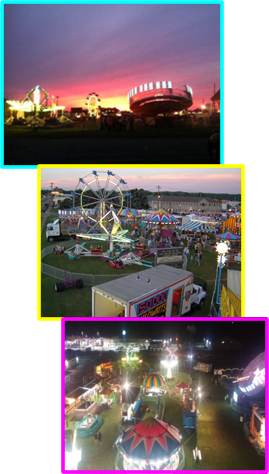 The idea was to have a small carnival, desiring weekend jobs in the Pittsburgh area. The goal was reached with ease. Longer hours and hard work soon took the company to the next level with the addition of more rides, games, and confections. Today, LAM Enterprises / Penn Premier Shows owns 18 rides, many cutting edge games of skill, and several specialty trailers offering delicious festival foods. We transport our own equipment to and from each location, and have a trained staff for set up, dismantling, and operations. Safety is a priority: We regularly attend industry safety seminars, comply with all PA Department of Agriculture requirements, have a certified ride inspector on staff, and are current members of NAARSO ( National Association of Amusement Ride Safety ). In addition, we have insurance coverage in place well in excess of the state minimum requirements. Some of the quality events that we currently serve include: the Raccoon Twp. Fair, the Jefferson Twp. Fair, the Transfer Harvest Home Fair, the Big Knob Grange Fair, Our Lady of the Most Blessed Sacrament Summerfest, the Mountain Area Fair, Ox Hill Fair, and the Harmony Grange Fair. A sincere thank you to all of the clients that have helped our success. Finally, our family is extremely proud of our heritage in the outdoor amusement industry, dating back to 1937. That is when Lloyd Serfass Sr. began the original Penn Premier Shows carnival, and started touring at local events in Eastern Pennsylvania. His company grew and prospered until his passing in 1961. Several years later, the carnival was dissolved, but not forgotten. For 2017, ( celebrating our 25th season ) we will pay tribute to Lloyd Sr., and tour once again as Penn Premier Shows. We pledge to continue with honest business practice, and always strive to provide first class entertainment to the Celebrations, Fairs, and Festivals that we serve.